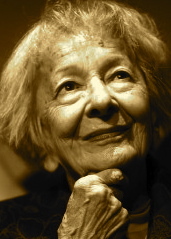 A Year of Being Here: Wislawa Szymborska: "Under One Small Star"
Truth, please don't pay me much attention. Soul, don't take offense that I've only got you now and then. My apologies to everything that I can't be everywhere at once. "Under One Small Star" by Wislawa Szymborska, from Poems New and Collected. Translated from the original Polish by Stanislaw Baranczak and Clare Cavanagh. © Mariner Books, 2000. Art credit: "Rigel (a single star) through the 60" [telescope]," image by unknown photographer at the Sahuaro Girl Scout Leaders' Astronomy Camp, April 4-6, 2003.